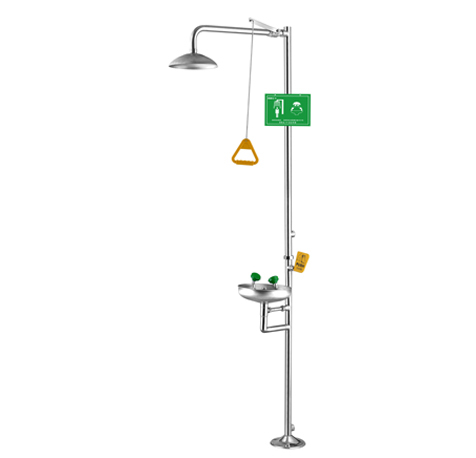 Model WJH0858 composite, shower and eye wash, / face wash unit and shower system, equipped with Runwangda eye wash, / face washer and shower head, and equipped with a green ABS basin receiver. The WJH0858 composite shower and eye wash/washer combination and shower system should include a 11″” (27.9 cm) green ABS plastic wash basin, Runwangda eye wash, / face wash head. Runwangda The eye wash/washer nozzle has a reverse laminar flow function, and zero vertical speed can be achieved through the integrated flow control function. The equipment should also include Runwangda hydraulic hydrodynamic design with flow control ABS plastic shower Sprinkler head, chrome-plated copper normally open ball valve with stainless steel cue, and chrome-plated copper in-line 50 x 50 water filter. In addition, the equipment should also include hot dip galvanized steel pipe with a wall thickness of 40, diameter 9″” (22.9 cm) powder coated cast iron floor flange base, eye wash nozzle yellow plastic overflow drain cover, self-adhesive high visibility green and bright yellow safety strip, universal logo and 1-1/4 “Inch IPS device. In the workplace where anyone’s eyes or body may be exposed to harmful or corrosive substances, emergency eye wash equipment or sprinkler equipment should be equipped in the work area with appropriate facilities for rapid flushing of the eyes and body. Use it immediately in an emergency. 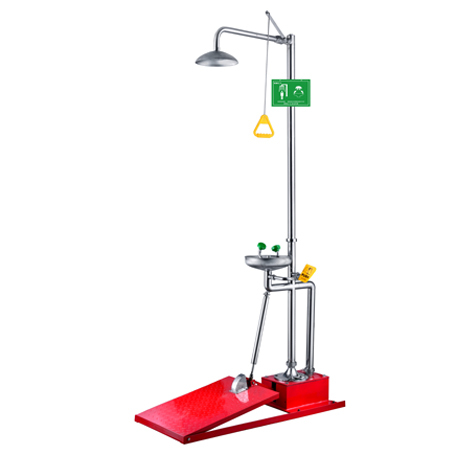 Emergency eyewash equipment and rain shower sprinklers should be located in an easily accessible location within 10 seconds and should be located in an unobstructed, easy-to-use location where injured persons can arrive in less than 10 seconds. 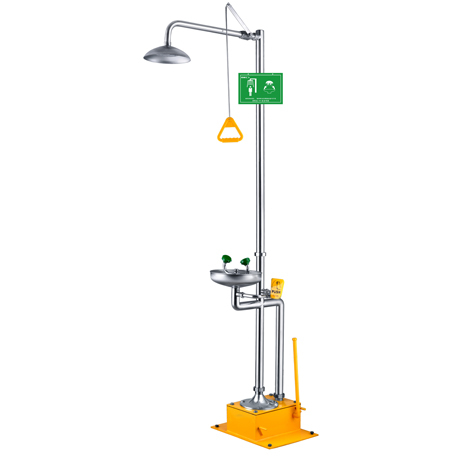 The Model WJH0858 sprinkler system is CSA certified and meets the ANSI Z358.1 standard for emergency eye wash and shower sprinkler systems. 1-1/4′′ inch IPS wall thickness 40 hot dip galvanized steel pipe fittings, fittings and a 9” inch (22.9 cm) powder coated cast iron floor flange base ensure corrosion resistance for durable products. The eye wash/washer and valve assembly are prefabricated and fully water/pressure tested to ensure no leaks and functionality, ultimately reducing installation time. The eye wash and shower spray ball valves are designed to flush away dirt by simply pulling the lever or pushing the stainless steel flag. Both valves are fitted with stainless steel clubs to better prevent corrosion and breakage. The chrome-plated copper in-line 50 x 50 water filter prevents impurities from entering the eye wash and keeps the device in optimal function. The filter is easy to maintain. Runwangda ABS Plastic Accident Shower Sprinkler Shower shower head is designed with hydrodynamic hydraulics to distribute water evenly throughout the flow path. The Runwangda Eyewash/Washing Sprinkler (patent pending) uses a reverse laminar flow function to remove contaminants from the vulnerable nasal cavity. Inspection Card Test Label: The SP170 is a green waterproof inspection test card with a date to fill in the date and the initials of the inspector’s name. It is used to record the weekly inspection and maintenance of weekly emergency equipment. 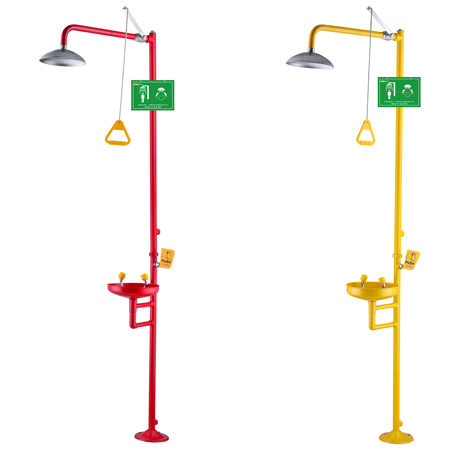 Large shower sprinkler / eye wash big logo: SP178LG is a vertical universal type of composite emergency shower and eyewash large logo type large vertical universal emergency shower and eye wash combination logo. Dimensions: 18″” x 24″ inches (45.7 x 61 cm). Foot pedal: The SP220 model foot control kit includes a powder coated aluminum foot pedal. Use this foot pedal to allow your hands to operate the eye wash freely.